It's colour challenge time at Global Design Project this week and I decided to go down the CAS (clean and simple) route simply because I find colour challenges, well.......a challenge! 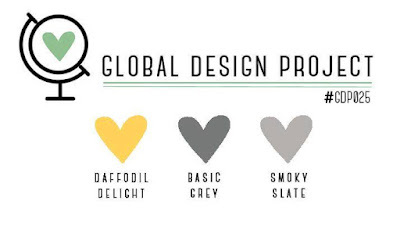 Even though we are using two neutrals, with Basic Grey and Smoky Slate, which I adore, throwing Daffodil Delight in the mix literally threw me into a tail spin. 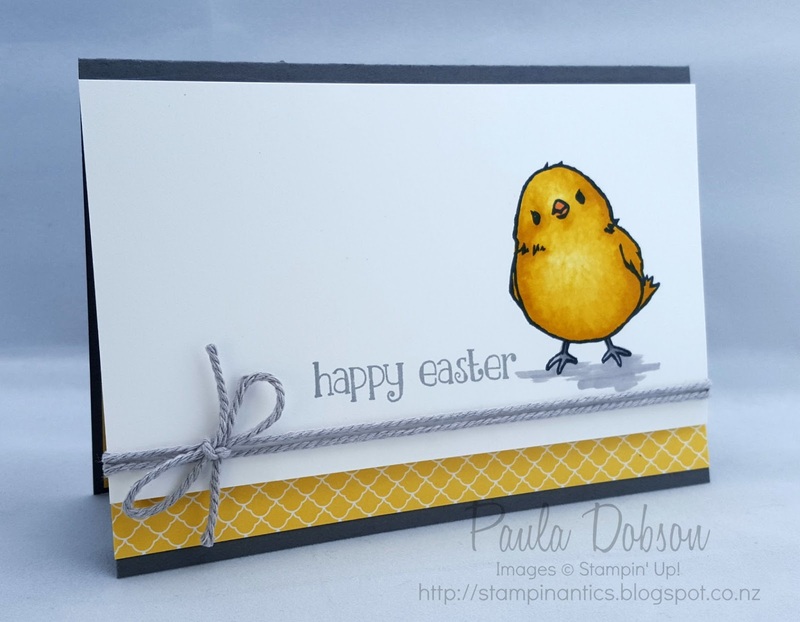 With Easter coming up early this year, and that delightful Chick available for FREE in the SAB set Honeycomb Happiness when you spend $110, I decided to get a head start on my Easter cards. The colours really lent themselves to the Easter theme. 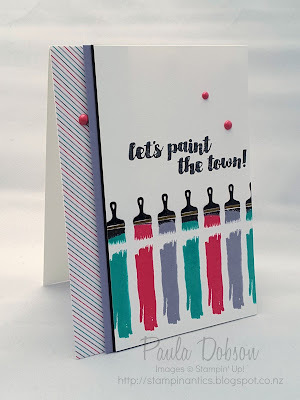 While Stampin' Up! no longer have Blendabilities, I did keep some for my own personal use. I love the texture I can create with an alcohol marker, and I used that to suggest soft, downy feathers taking this Chick's cuteness factor up another notch! I then added a strip of Daffodil Delight DSP, really making that colour the hero on my project. While my design is clean and simple this week, if you want real "wow" than you won't want to miss what the rest of Global Design Project dream team have created! Make sure you leave them all some comment love so they know you visited! 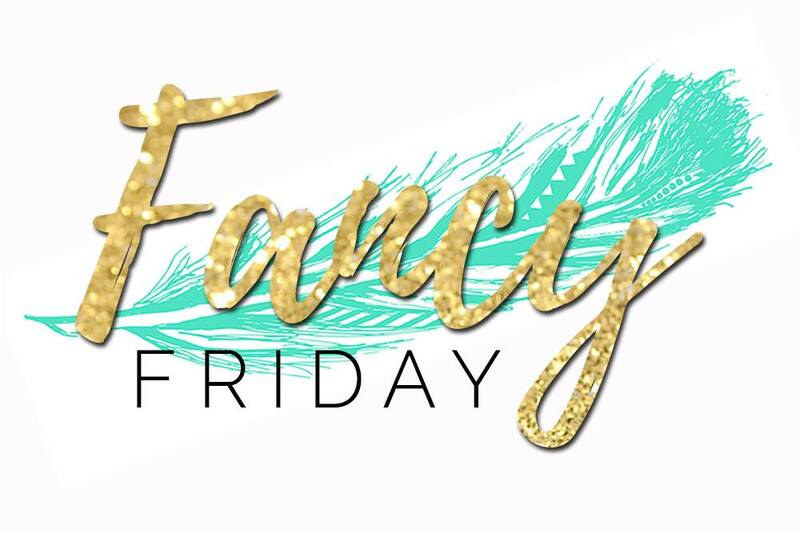 To create this project, I used the following products, available for purchase at my Online Store: Spend $110 until the end of March and choose a FREE SAB item! If you live in New Zealand, I would love to be your Demonstrator. When you shop Online with me, please allow Demonstrator Contact, so I can thank you properly when you place your orders. A cyber friend of mine is going through a tough time right now and I just wanted to let her know I was thinking of her and praying for an excellent outcome. So I broke out my trusty sponges and hit the colours! 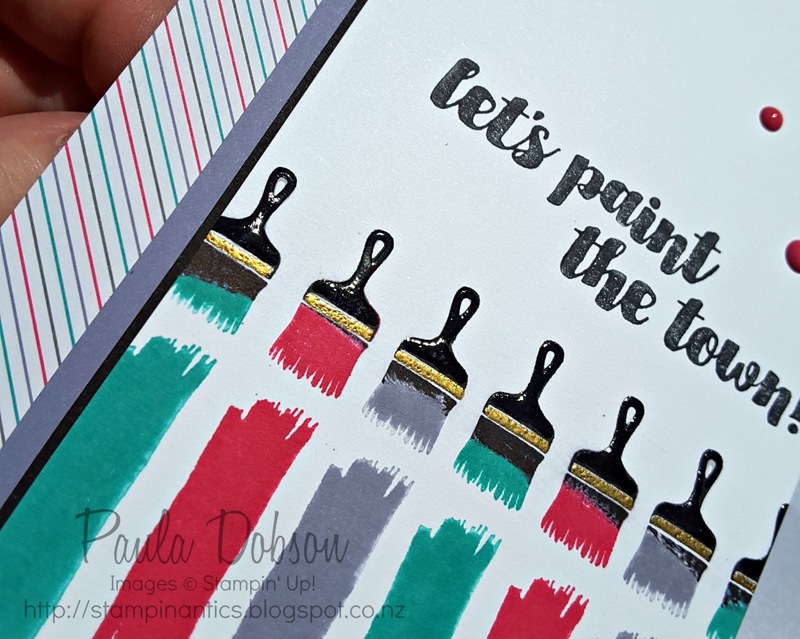 I loved the Project Life stamp set "Memories in the Making" for this fun circular "squiggle" and some of the sentiments and sayings. Once I sponged my colour and splattered water over the top, I stamped the squiggle in Basic Black Archival Ink. I wrapped some Gold Metallic thread around my fingers and laid that over top of the squiggle before adhering my sentiment. I liked that the thread mimicked the stamp! 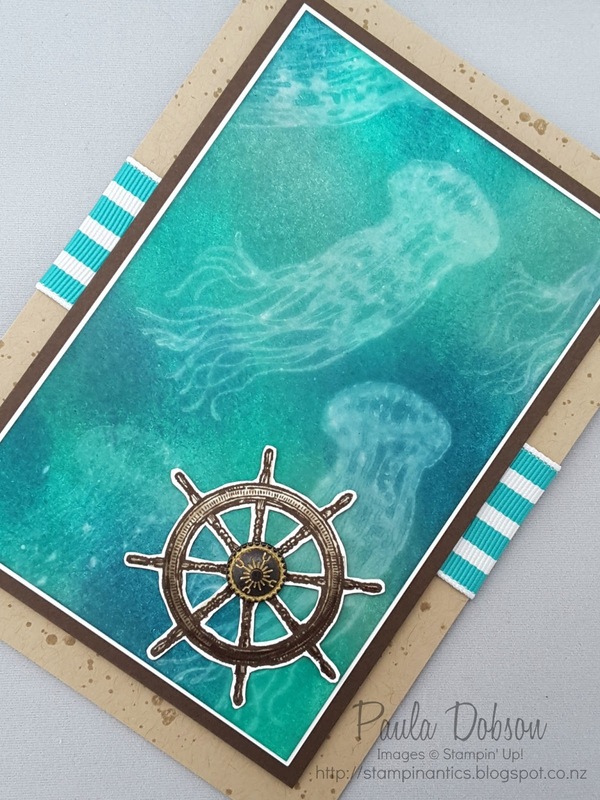 I also stamped the the circular image over the entire base card in the same colour for a tone on tone look. I only put the first part of the sentiment on the front, the rest is inside and reads......Sunny days ahead. Sounds so much brighter than "Get well soon", don't cha think?! Some pretty sparkly sequins finished my project. I hope this card brightens her day when she finally receives it. It is travelling from little old New Zealand all the way to Canada! Quicker to talk online, I know, but nothing says "I care" more than a handmade card in my opinion! 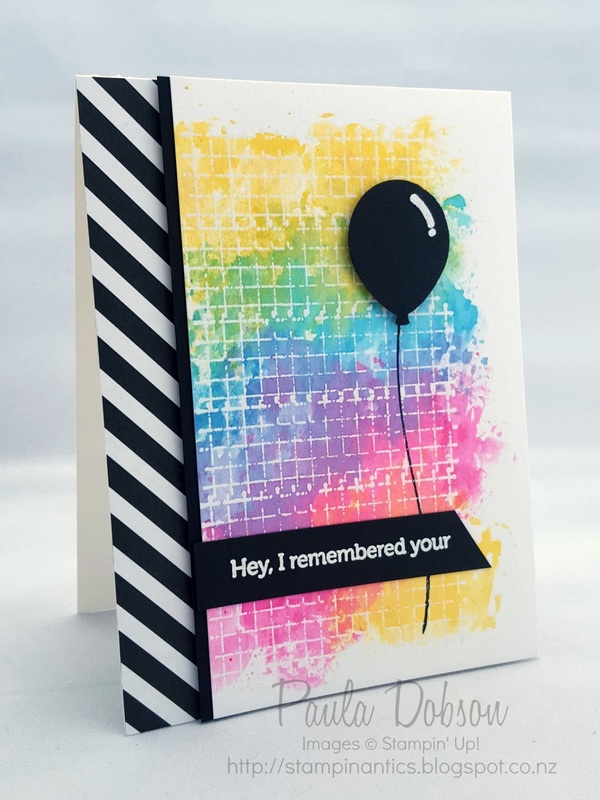 I really liked the colours on this card, but I am not a huge fan of using DSP on my cards. I really don't like to cut up all the pretty paper, lol. But I did decide to make my own designer background by using the same colours to watercolour a tartan. I used a number of different brush sizes and a ruler as a guide so my lines remained relatively straight! I also used Stampin' Up! 's watercolour paper for the background and my art piece. I stamped my lamb in Black Staz On before watercolouring and then I added just a touch of Wink of Stella to his fleece to make him shimmer. This stamp is called Easter Lamb, but you don't have to use him just for Easter! I used him to make a baby card for one of my fellow Global Design Project team mates, Bibiana Cameron, who just recently had a wee baby boy. This card is now winging it's way to Scotland - hence the tartan background! 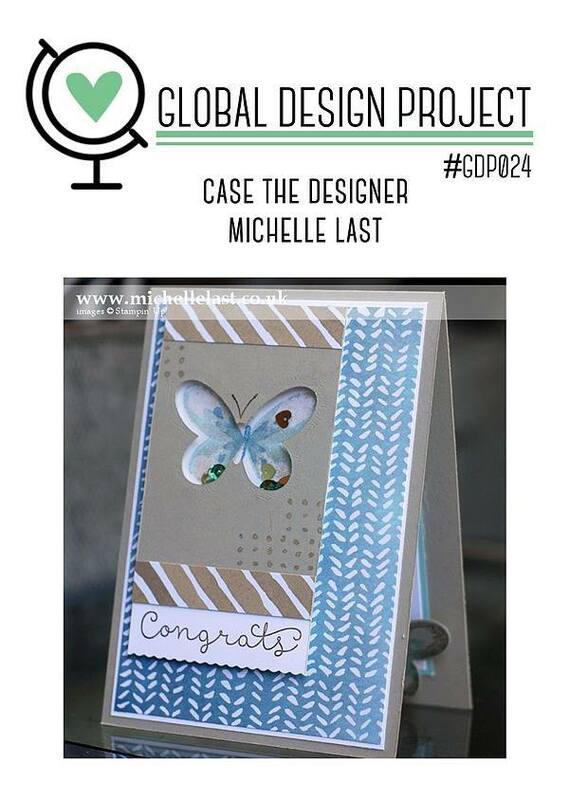 I hope you will find some inspiration of your own and join me and the rest of the design team with a work of art of your own this week! It's a theme challenge again at Global Design Project this week and I sure hope you can join in with us. The number of entries we have been getting each week has been amazing and we appreciate each and everyone! It sure makes it hard to pick our winners! 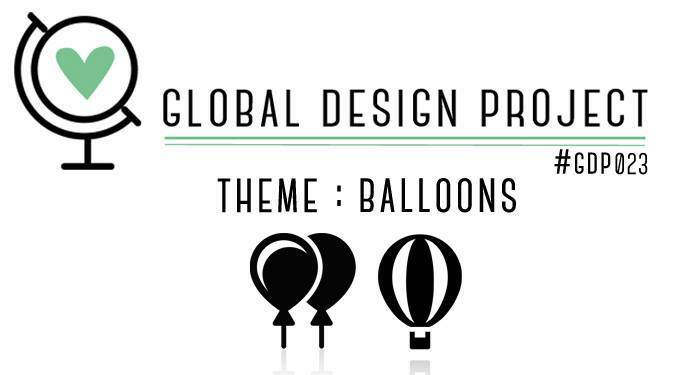 So the theme is balloons. I am only glad the are stamped or punched, as I don't actually like balloons that much. Long story short - one popped while I was blowing it up when I was at school. I can still feel the sting! But I digress. 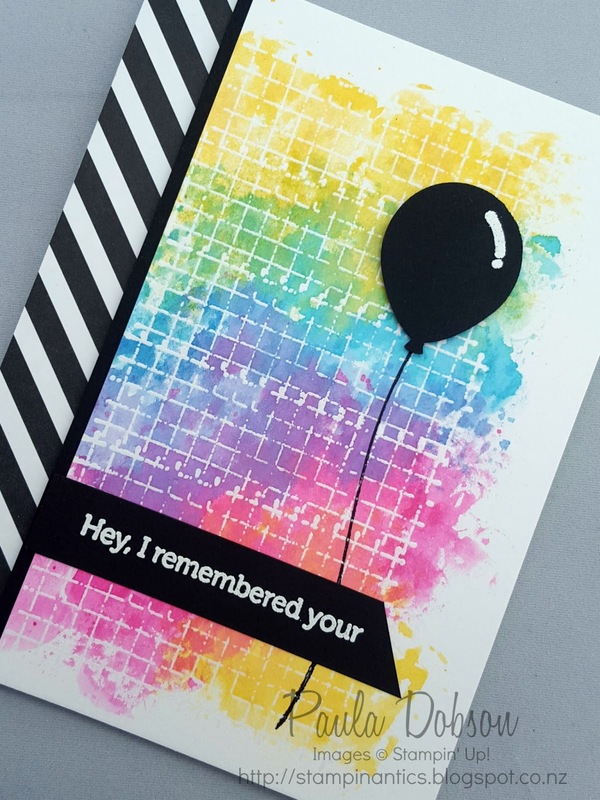 We have a number of stamp sets in our current catalogues that feature balloons, which I gave serious consideration to before going ahead with this card. However, I didn't use any in the end because of how colourful my background actually turned out. I have recently signed up for the Watercolor For Card Makers - Intermediate Techniques Class, so you will probably be seeing a lot of my watercolour experiments, lol. I love the stark contrast the black gives to this background and any more than one balloon would have just swamped it. 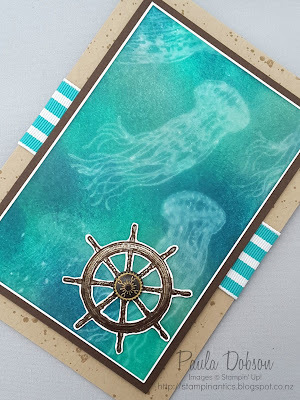 I have used the grid stamp from Timeless Textures to create my grid background by heat embossing clear embossing powder, then adding my colour over top, creating a resist effect. 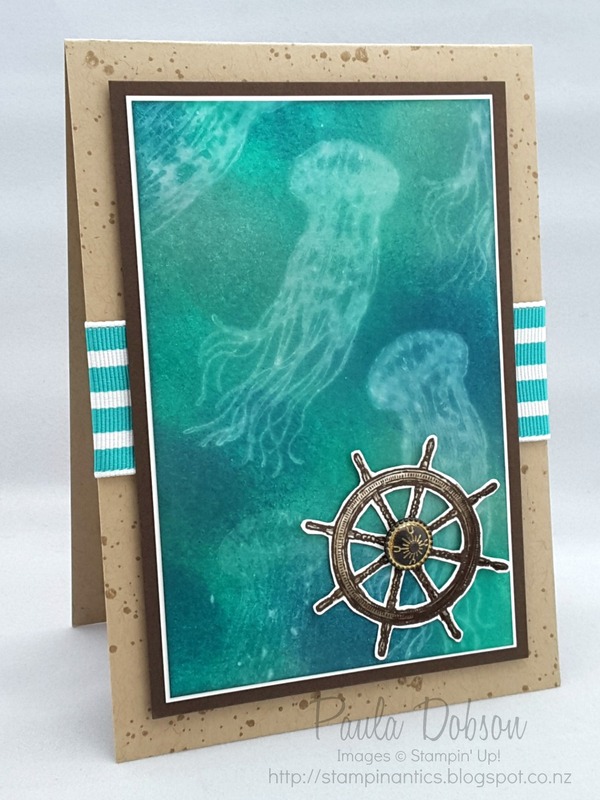 That is all I can tell you for now, as I will be teaching this card to a group of friends soon and I don't want to spoil the rest of the technique, lol. 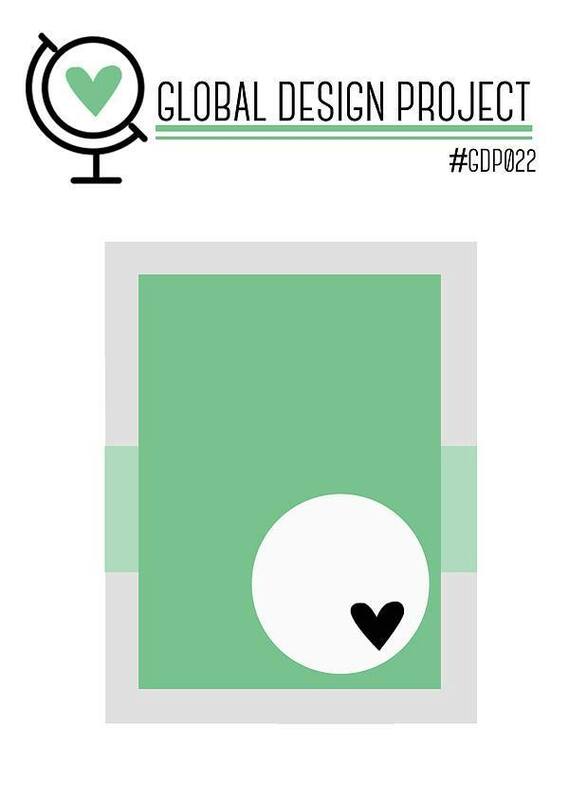 I love a good sketch challenge to inspire me and that is exactly what we have on offer at Global Design Project this week. Teneale Williams comes up with the best sketches for us to play along with! When I first saw the sketch I immediately thought "Valentine", since we are only a week away from that particular celebration. 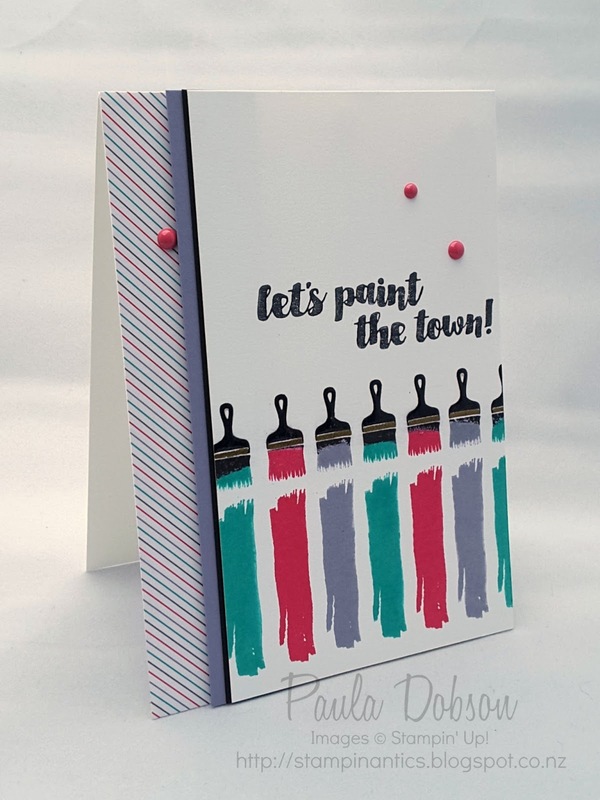 But then I figured, it doesn't have to be a romantic card in the traditional sense, so I set about creating a card that would still appeal to a guy (if a woman was giving it), but not be smothered in pinks, reds and hearts! I love the soft, almost ethereal look of the technique I used to create this watery picture. Called Water stamping, it gives a ghostly appearance to your images. The trick was to heavily apply ink to the card. 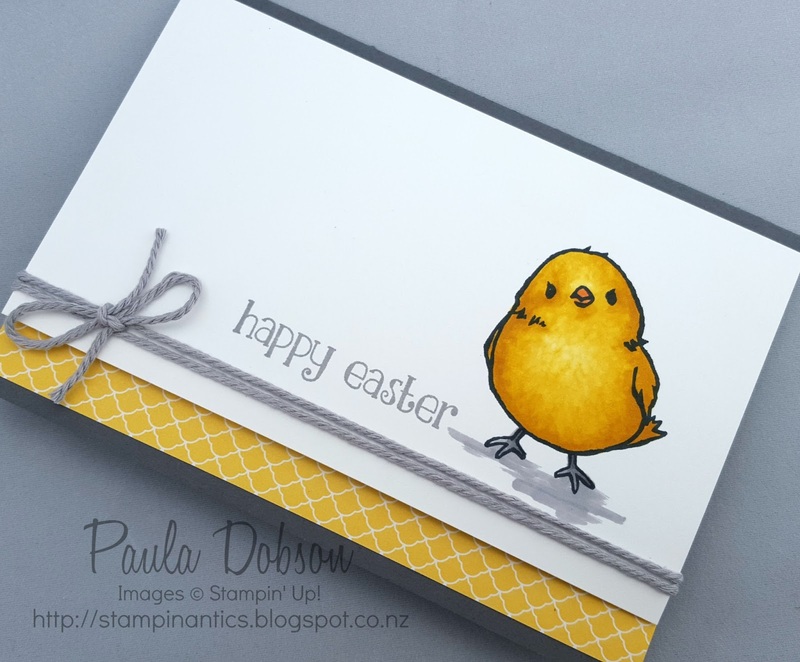 Spritz the stamp with a fine mist of water from about 30cm away, then stamp on your inked card. I held it for a few seconds just to be sure the water was actually picking up some of that ink. I have to tell you something funny. My husband, who is a guy (yes, he is), DOES NOT LIKE IT! I appreciate honesty, but you could have softened the blow a little sweetie, lol. But as with anything, I know this will really appeal to some and not to others and that's Ok. I like it. What do you think? 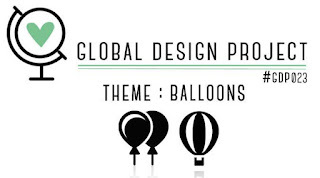 The Design Team at Global Design Project have been astounded by the number of entries we have had playing along recently and we are truly grateful for each of you who enjoy the challenges we set each week. We hope you will play along this week too. 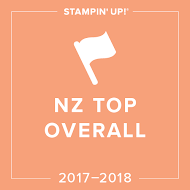 If you would like to order Stampin' Up! 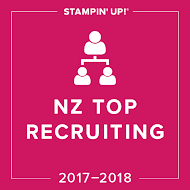 products and you live in New Zealand, simply click HERE to be taken to my Online Store. 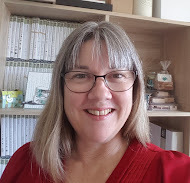 If you live anywhere in New Zealand, I would love to be your Demonstrator. Please allow "Demonstrator contact" so I can thank you properly when you place your order! This week at Global Design Project we have the colour challenge that really will challenge you, at least it did me! I was excited not to see any greens or reds in there though! You can thank the great Brian King for this colour choice! Soooooo.......Where to start when you are stumped? Designer Paper. The Have a Cuppa DSP stack has these colours in it, so I pulled out a sheet I wanted to use as an accent and then went from there. I love the paint brushes in the hostess set "Love You Sew" and have been wanting just the right project to use them on. 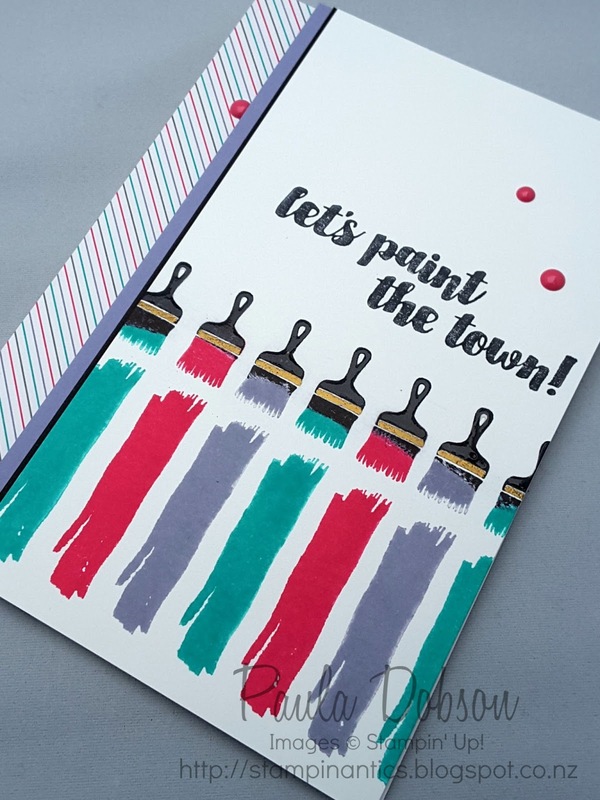 When I couldn't think of a single thing to do with this colour scheme, I figured brushstrokes of different colours was just perfect! Those who know me, know I can't just stop there and I had to put a little more detail into the paint brushes. If you look closely you will see each handle is shiny with a gold "metal" rim. I used a Versamark pen to add ink where I wanted the gold embossing, and I used the Fine-tip Glue Pen to add the shine to the handles. It is a fabulous glue but an even better lacquer for small spaces! I also changed up the sentiment stamp. The stamp has the words one above the other, yet I wanted the words across my card. So I pulled out my stamp-a-ma-jig, inked and stamped each word separately to get it looking how I wanted. A word of advice - make sure there is no residue on your stamp when stamping the next word! How do I know that? I hope you feel somewhat inspired, and don't find this colour challenge too daunting. Just pull out that DSP you have lying around and go from there! 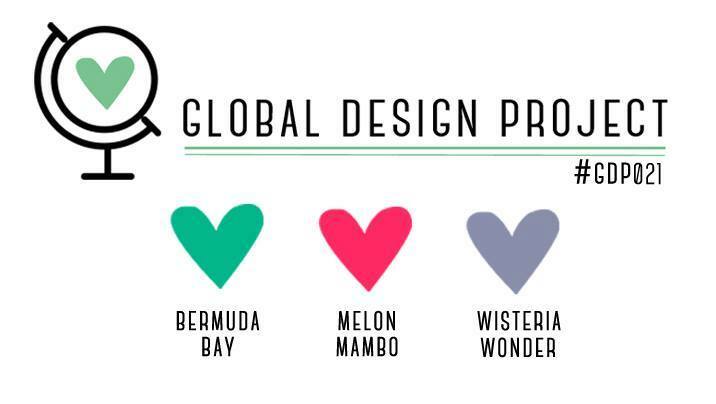 Join the rest of the Global Design Project design team to see the deliciousness they have come up with this week. Thanks for playing each week!